Christmas is around the corner, I live in London and the city has been glowing with Christmas lights for almost 1 month! That may seem early but with the days getting shorter, darker and colder I don’t mind all the glitter so much, in fact I love it! 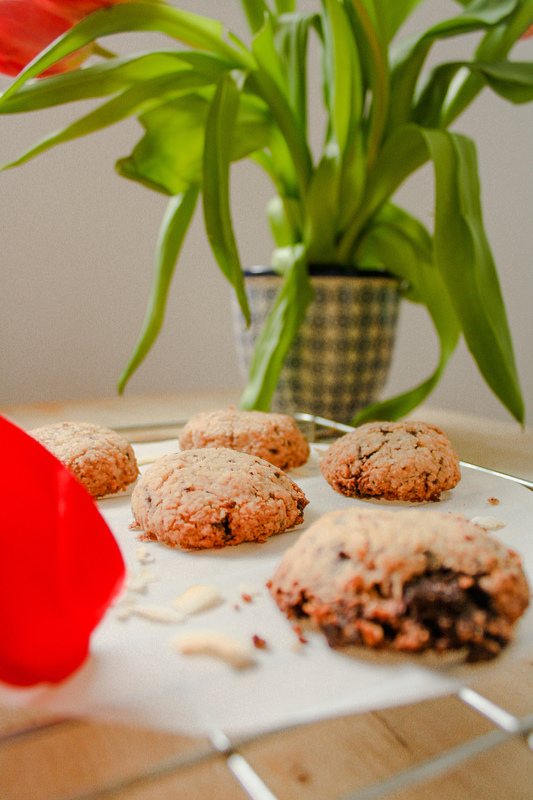 I am celebrating the Christmas season with a series of Christmas recipes, starting with these Coconut Chocolate Chips Cookies. 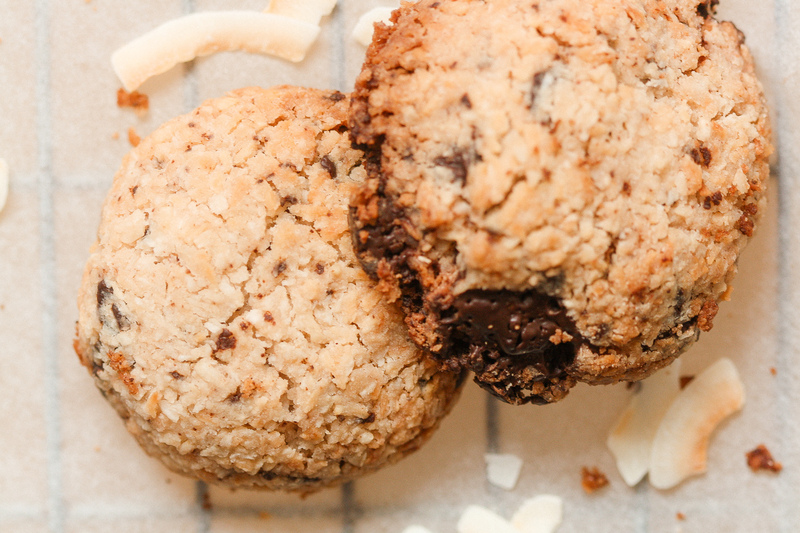 These Coconut Chocolate Chips Cookies make the perfect treat and will help you to destress while you are getting the house ready for Christmas, the gifts wrapped, and dinner in the oven! They will take you less than 10 minutes to put together. I have been very generous with the amount of shredded coconut in this recipe, that is because coconut is naturally sweet and so it means we don’t have to add much cane sugar to the recipe. Even though I am using an unrefined cane sugar, it is best to keep an eye on the amount we consume each day and replacing white sugar to cane sugar or maple syrup is a good starting point. 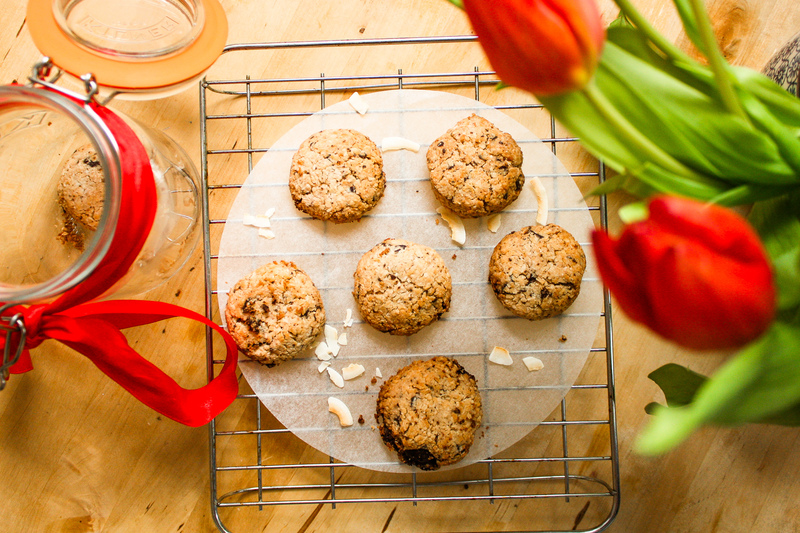 This coconut cookie recipe will take you less than 10 minutes to put together, leaving you with a delicious treat that happens to be gluten-free and dairy-free too! In a large bowl whisk together the shredded coconut, rice flour, salt, sugar cane and dark chocolate chips. Combine in the coconut oil and mix with your hands until crumbled and no chunks of coconut oil remains. Add the dairy-free milk and form a big cookie ball. If it doesn't come together add a little bit more milk. Scoop 2 tablespoon of the cookie dough onto the prepared baking tray and pat it slightly. Bake for 20 minutes, until they turn a lovely golden brown. Do not worry if your cookies come out of the oven soft, they will harden as they cool. Wait 5 minutes and place on a wire rack for 10 minutes. I keep mine in a cookie jar for up to 1 week.